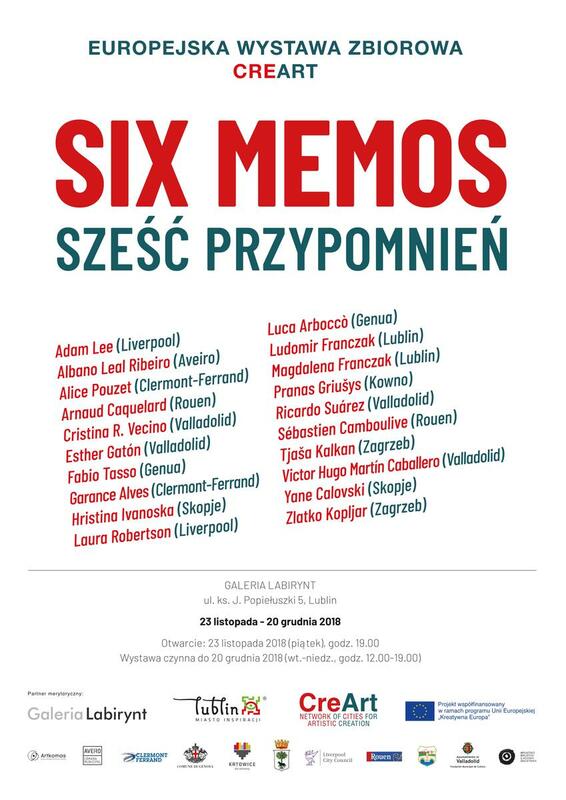 "Sześć przypomnień" / "Six Memos" is the first European collective exhibition as part of the second edition of the CreArt project. The exhibition was presented in Valladolid in July / August 2018. From November 23 to December 20, 2018 will be presented in the Gallery Labyrinth in Lublin. The third partner city that will host it in January / February 2019 is Liverpool. The name of the exhibition "Six Memos" refers to a collection of essays by the Italian writer Italo Calvino "American lectures. Six reminders for the next millennium. " The exhibition is based on the concept of six concepts - "Lightness", "Accuracy", "Speed", "Transparency", "Multiplicity", "Compactness" ("Lightness", "Exacititude", "Quickness", "Visibility", "Multiplicity") "," Consistency "), which are to help in understanding the process of constant transformation of the modern world. This process in Calvino is reflected mainly in literature and language, although its reflection can also be found in the broadly defined art, society and culture. These six concepts, which Calvino describes as universal values, are at the same time the legacy of past and future generations. They also constitute a framework for activities in contemporary artistic practices involved in issues related to broadly understood social and cultural issues, but also institutional critique or ideas about the future. Thirty years after the publication of the essays, we will attempt to verify the Calvino forecasts and look again at the issues related to the heritage of humanity, civilization and collective imagination. The exhibition is attended by twenty artists from the partner cities of the "CreArt. A network of cities for artistic creation. " They are: Adam Lee (Liverpool), Albano Leal Ribeiro (Aveiro); Alice Pouzet (Clermont-Ferrand), Arnaud Caquelard (Rouen); Cristina R. Vecino (Valladolid); Esther Gatón (Valladolid); Fabio Tasso (Genoa); Garance Alves (Clermont-Ferrand); Laura Robertson (Liverpool); Luca Arboccò (Genoa); Ludomir Franczak (Lublin); Magdalena Franczak (Lublin); Pranas Griušys (Kaunas); Ricardo Suárez (Valladolid); Sébastien Camboulive (Rouen); Tjasa Kalkan (Zagreb); Victor Hugo Martín Caballero (Valladolid); Yane Calovski and Hristina Ivanoska (Skopje); Zlatko Kopljar ​​(Zagreb). The curator of the exhibition is a Croatian art historian, Branka Benčić. The exhibition will take place as part of the "CreArt. A network of cities for artistic creation "co-financed under the European Union program" Creative Europe ". The project's lecherous partner is Galeria Labirynt.